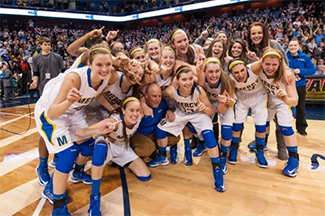 UNCASVILLE - The Mercy of Middletown girls' basketball team spent the final 3.8 seconds of Saturday's CIAC Class LL final going from, "not again", to, "are you kidding me?" Maria Weselyj made a 3-pointer at the buzzer to give the top-seeded Tigers an improbable 54-53 win over No. 2 Lauralton Hall of Milford at Mohegan Sun Arena. "I'm a confidant enough shooter for it to go in and it went," Weselyj, a senior, said. "I can't even explain the feeling." It looked like Mercy was about to lose its fourth straight final after Michelle DeSantis made a layup with 3.8 seconds left in the game to give the Crusaders a 53-51 lead. The play was made possible by Maggie Salandra's steal with 20 seconds remaining. Mercy called two timeouts to set up a play. Sheena Landy threw the inbounds pass from the baseline across halfcourt. The Tigers' Cassandra Santoro somehow caught the Hail Mary in traffic and passed the ball to her right to an open Weselyj. Weselyj, who shot 3-of-9 from the field, got her 3-pointer off just in the nick of time. "I needed to pop it and we needed to win this for our seniors, our coach, our team, our community" Weselyj (eight points) said. "Three seconds of my life just passed by. It was gone, but it was a surreal moment." Tigers coach Tim Kohs said, "The way Maria had a rough game (shooting), you couldn't get a better ending to a high school career for a kid that's been unbelievably important to us and is an unbelievably hard-working kid. I couldn't be happier for her and the whole team." Jordyn Nappi scored 13 for the Tigers (25-2) while Landy had 12 points and six rebounds. 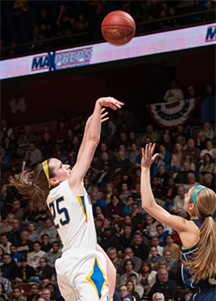 Maura Fitzpatrick added 11 points. Carly Fabbri scored a game-high 20 with three steals for the Crusaders (24-2) and Olivia Levey had 13 points and six rebounds. DeSantis scored 11. "I think we definitely showed Lauralton basketball's best season ever," DeSantis said. "We worked hard to get here. Everyone gave it their all. Literally, we were so close." The lead changed nine times in the game with neither team being able to lead by more than seven points. Mercy led 51-47 with less than three minutes remaining. DeSantis scored six straight to give Lauralton the lead. The Tigers' followed with the most remarkable of endings. "I always say to them, 'We'll get them next year, we'll get them next year," Kohs said. "And you wonder when that year is going to come. "I'd rather win by 20 because I wouldn't have to have a stroke on the sidelines, but once you win like that, we'll take it, what the heck." Points in the paint-LAURAL 18,MERCY 26. Points off turnovers-LAURAL 21,MERCY 12. 2nd chance points-LAURAL 8,MERCY 16. Fast break points-LAURAL 6,MERCY 4. Bench points-LAURAL 2,MERCY 6. Score tied-7 times. Lead changed-9 times. Last FG-LAURAL 4th-00:04, MERCY 4th-00:02. Largest lead-LAURAL by 7 1st-01:24, MERCY by 5 2nd-07:02. Technical fouls: Lauralton Hall-None. Mercy-None.